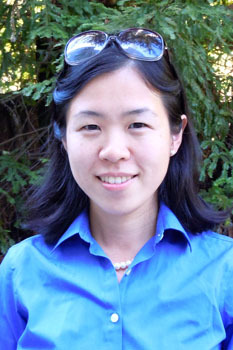 The Economics Department is pleased to welcome its newest faculty member, Assistant Professor Grace Gu, who is joining the department this Fall 2013. Grace worked in various policy institutions including IMF, Brookings, Federal Reserve Bank of Cleveland and American Enterprise Institute. She received her Ph.D. in Economics at Cornell University and she employs state of the art quantitive methods such as nonlinear dynamic programming and economics. Her research interests include macroeconomics, international economics, labor markets and banking sector. Her completed papers include: "Taxation and Leverage in International Banking," "Does Foreign Intellectual Property Rights Protection Affect U.S. Exports and FDI?," "Harnessing Globalization in South Asia" and "An Awkward Dance: China and the United States." She was awarded Beijing Foreign Studies University Best Thesis Award in 2006 and Southern Economic Association Graduate Student Workshop Award in 2012. Grace will be teaching 100B, Intermediate Macroeconomics in Winter 2014 and 241B, International Finance in Winter and Spring 2014.